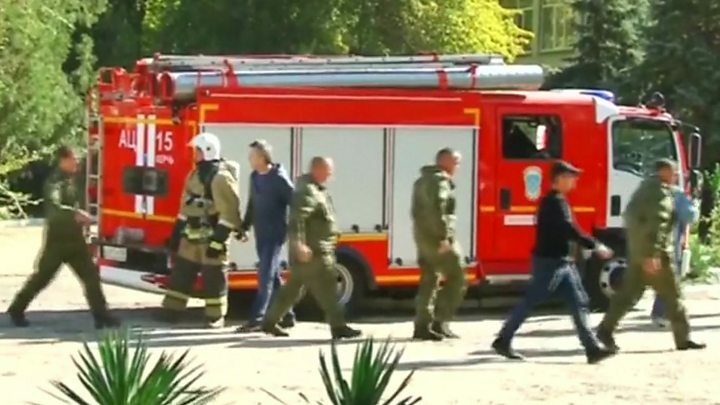 Image caption Russia has said the attack was an act of "mass murder"
At least 19 people have been killed and dozens more wounded in a shooting at a college in Russian-annexed Crimea. An 18-year-old student ran through the Kerch technical college firing at fellow pupils before killing himself, Russian investigators say. Witnesses have also spoken of at least one blast caused by an unidentified explosive. The motive is unclear. Russia seized Crimea from Ukraine in 2014 in a move condemned by many Western powers. The annexation marked the start of a simmering conflict involving Russian-backed rebels in eastern Ukraine that goes on to this day. What happened at the college? There are contradictory reports about the chronology of Wednesday's attack. The alleged perpetrator, named Vladislav Roslyakov, is said to have run from room to room as he fired, starting in the area near the canteen. He then shot himself dead, Russia's investigative committee said. Photos later emerged in Russian media purportedly showing the body of the attacker in the college library. The investigative committee said initial examinations suggested all the victims died of gunshot wounds, but some reports speak of shrapnel injuries. At the same time, Russia's law enforcement sources are quoted by local media as saying that the attacker had detonated a bomb in the canteen before starting shooting. Soon after reports of a blast in the college, investigators released a statement saying an explosive device filled with "metal objects" had detonated in the dining area. Several witnesses maintain they heard one or more explosions. Investigators later said they found a second device among the personal possessions of the gunman and that it had been disarmed. BBC Russian has been speaking to witnesses, including Igor Zakharevsky, who was in the canteen when the gunman struck. "I was at the epicentre of the first explosion, at the entrance, near the buffet," he said. "I was in complete shock and one of my classmates started pulling me away. Then I heard several shots at intervals of two or three seconds. After a while there was another explosion." A businessman near the college described hearing an explosion and seeing a large window shatter. The incident was earlier described as a "terrorist act", but Russia's investigative committee has now reclassified it as "mass murder". Three days of mourning in Crimea have been declared from Thursday. Until now, if you had told people in Crimea there had been a mass school shooting, most would have thought you were talking about the United States. Now all that has changed. The shooting spree in the Kerch Polytechnic has left the peninsula, annexed by Russia from Ukraine in 2014, in shock. But should it come as such a surprise? There have been five attacks in schools in Russia this year where a number of children were injured. In Kerch, questions are already being asked: how did Vladislav Roslyakov manage to obtain a licence for a hunting weapon? And how was he able to launch such a deadly attack on his college? What do we know about the alleged gunman? His precise motives remain unclear. But there are suggestions the fourth-year student had developed a hostile attitude to the college. Russia's RBC TV interviewed a friend who said Roslyakov "hated the technical school very much" and had vowed "revenge" on his teachers. It was reported that the attacker had recently been given a weapons permit, but Crimea's ombudsman for the rights of the child, Irina Klyueva, later questioned this. "As far as I understand, it was fake information, although it is not yet known exactly," she was quoted as saying by Russia's Gazeta.ru. Classmates also say the suspected attacker was very self-contained, hardly communicated with anyone, and had long ago stopped using social networks. A local official said most of the victims were students of the college, which is a vocational school for 850 teenagers. A major emergency response operation was launched as the victims were taken to hospitals. At least 40 people were injured. What is the political situation in Crimea? The peninsula has been a major area of dispute between Russia and Ukraine. Ukraine, and many other countries, have never recognised its annexation four years ago. The Crimea issue and the presence of Russian-backed rebels in eastern Ukraine continue to strain relations. Kerch is situated at the point where Russia built a bridge between the Crimea and Russia. In a reminder of how poor relations are between Russia and Ukraine, the speaker of the Crimean parliament, Vladimir Konstantinov, suggested Kiev might have been behind the attack. "The entire evil inflicted on the land of Crimea is coming from the official Ukrainian authorities", he said.